Here are a few pics of my recent addition. A 73 Ducati 750 GT that was found in a backyard in Juarez Mexico. Suzuki is looking for the biggest…the baddest…and the best custom ‘Busas to come out and represent during the kickoff of Suzuki’s “The Ultimate Hayabusa” contest at Daytona Bike Week. The nationwide search for The Ultimate Hayabusa begins right in the heart of Bike Week at the Suzuki display in Daytona Beach, Florida on March 14th, 15th and 16th. So, if you’re going to Daytona Bike Week and want to join the contest as soon as it kicks off, then email us your info and tell us if you’d like to participate in Suzuki’s display at Daytona. We’d love to showcase all your hard work during one of the days we’re there! And to kick this event off in style, those that participate at Daytona will be entered in a daily contest where you can win an 32gb iPad Mini with the Hayabusa Kanji etched on the back of the iPad. Email us at daytona@ultimatebusa.com to tell us about your bike and your interest in displaying it at Suzuki’s booth during one of those three days – make sure to send a picture or two of your custom Busa, too. And for those of you that won’t be at Daytona, but think you have a shot at claiming the title of owning the baddest ‘Busa out there, make sure you register at ultimatehayabusa.com and get ready to do battle! The full Ultimate Hayabusa website experience will kick off on March 11th, but here’s a preview of how it works—Hayabusa owners will enter photos of their custom Hayabusa at ultimatehayabusa.com. Users will view and vote for their favorites, ranking them in a National bracket-style competition, where one Hayabusa motorcycle and owner will be crowned as The Ultimate Hayabusa. In addition to regional prizes, the grand prize winner will receive a 2013 Limited Edition Hayabusa! 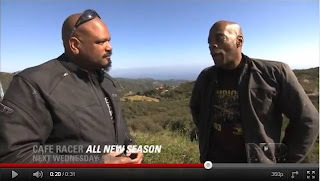 Oakland, FL (August 04, 2011) – Nick Anglada Originals is at it again with another appearance on Velocity’s (formerly Discovery HD) ‘Café Racer’. This week Alonzo Bodden’s Café Fighter Ducati 1098, resurrected by Nick Anglada and his team after a crash at Buttonwillow raceway, is featured. You’ll get a behind the scenes look at Nick, his team and a close up look at this throwback masterpiece. Check your local listings for air times. Click HERE or the image below for a preview of this week’s episode. Also keep an eye out for Alonzo’s Ducati, pictured below, in this month’s issue of Cycle World Magazine. A lot went into bringing the incredible Café Fighter to life. Sponsors for the bike include DoubleDog Moto, Bazzaz Performance, Driven Research, Carrozzeria Wheels, Beringer Brakes, and Speedymoto. You can find parts from these companies and true Nick Anglada Originals at http://www.NickAngladaOriginals.com/shop/. Along with the exciting new features Nick Anglada Originals will also have its new t-shirts for sale this week at http://www.nickangladaoriginals.com/. Visit the site to keep up to date on the latest from the team and get up close and personal with Nick by listening to his latest podcast. Nick Anglada Originals is based in Oakland Florida. Nick has been designing and building motorcycles since 1998. Originally focused on sportbikes, Nick Anglada has moved beyond that genre to embrace new brands, new models, and new customers. Anglada’s work with major endemic and non endemic brands such as Yamaha, Suzuki, Famous Stars and Straps and LRG has garnered him major media exposure across the globe. With over 16 magazine covers worldwide, Anglada has been featured on television shows such as Speed’s Superbikes, Discovery HD’s Café Racer and ESPN2’s Metric Revolution. Nick Anglada Originals was founded in February 2009 as premium brand targeting high profile builds and customers. Winter Garden, FL (Sept 22nd , 2010)— Premier sport bike designer, builder and customizer, Nick Anglada Originals, is proud to announce that it has signed SCT Performance as their preferred and exclusive provider of handheld automotive performance / fuel economy programmers and custom tuning software for Transport Vehicles. Anglada will only use SCT Performance in the Nick Anglada Originals tow vehicle, forsaking all other competing automotive performance / fuel economy programmers and custom tuning software products. In addition to utilizing only SCT Performance products, Nick Anglada will make special guest appearances with his custom bikes at motorcycle and automotive shows with SCT Performance throughout the 2010 and 2011 season. Be sure to check out www.nickangladaoriginals.com for dates and locations. "SCT Performance LLC. is a leading provider of handheld automotive performance / fuel economy programmers and custom tuning software for Ford, General Motors and Dodge / Chrysler vehicles, and the official Ford truck tuning device provider for National Diesel Motor Sports. Founded in 2003 by hard-core automotive enthusiasts, SCT's employees share a passion for the products they create and the performance vehicles that utilize them. Our employees are not just engineers, managers and sales people. Many are performance enthusiasts that build, race and drive high performance vehicles." Cypress CA.-August 24, 2010 – Yamaha Motor Corporation is pleased to announce a ground-breaking collaboration with the Palms Casino Resort in Las Vegas, NV. The Yamaha and the Palms Casino Resort “Life in the Fast Lane” Sweepstakes will reward one lucky winner with an all inclusive trip for two to the Palms Casino Resort and a new Palms ‘themed’ Yamaha R1 supersport motorcycle designed and customized by Nick Anglada Originals and loaded with exciting aftermarket parts and accessories. Scheduled to run from August 2010 to March 6, 2011, the “Life in the Fast Lane” sweepstakes will be promoted on line at http://www.yamaha-motor.com/ and will include a display on the casino floor of the Palms showcasing the customized R1 together with additional information on Yamaha motorcycles. OK. So you guys want a FREE bike?? Well here it is!! Nick Anglada Originals is creating a 2010 Honda Sabre inspired by Complex Magazine! Learn more about my design process, my thoughts on the new line of motorcycles and how I will turn the Sabre into a unique "moving piece of art." Enter for your chance to win now!